This protocol describes a method to image resident tumor-infiltrating CD8 T cells labeled with fluorescently coupled antibodies within human lung tumor slices. 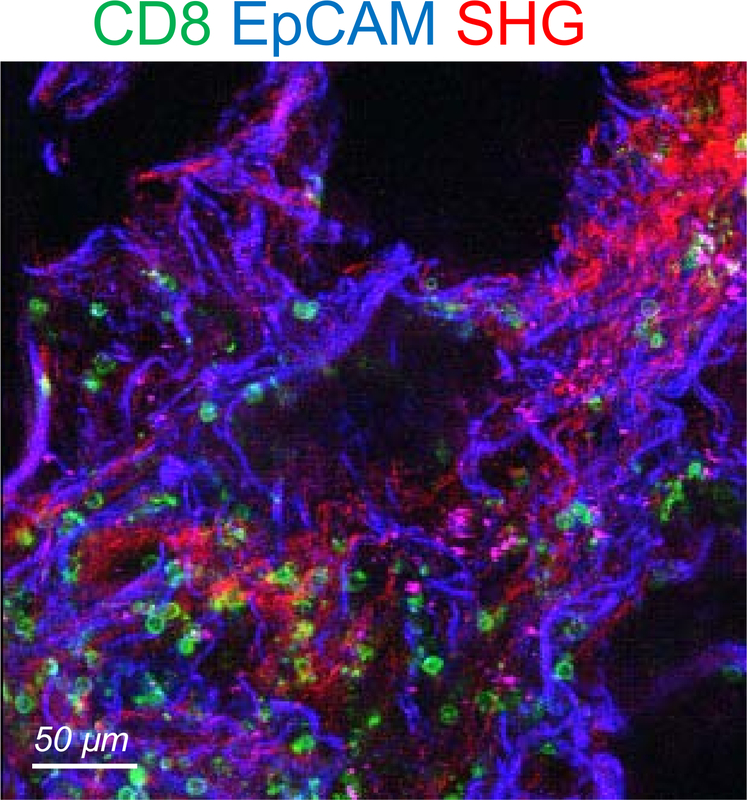 This technique permits real-time analyses of CD8 T cell migration using confocal microscopy. Peranzoni, E., Bougherara, H., Barrin, S., Mansuet-Lupo, A., Alifano, M., Damotte, D., Donnadieu, E. Ex Vivo Imaging of Resident CD8 T Lymphocytes in Human Lung Tumor Slices Using Confocal Microscopy. J. Vis. Exp. (130), e55709, doi:10.3791/55709 (2017). CD8 T cell are key players in the fight against cancer. In order for CD8 T cells to kill tumor cells they need to enter into the tumor, migrate within the tumor microenvironment and respond adequately to tumor antigens. The recent development of improved imaging approaches, such as 2-photon microscopy, and the use of powerful mouse tumor models have shed light on some of the mechanisms that regulate anti-tumor T cell activities. Whereas such systems have provided valuable insights, they do not always predict human responses. In human, our knowledge in the field mainly comes from a description of fixed tumor samples from human patients, as well as in vitro studies. However, in vitro models lack the complex three-dimensional tumor milieu and, therefore, are incomplete approximations of in vivo T cell activities. Fresh slices made from explanted tissue represent a complex multi-cellular tumor environment that can act as an important link between co-cultured studies and animal models. Originally set up in murine lymph nodes1 and previously described in a JoVE article2, this approach has now been transposed to human tumors to examine the dynamics of both plated3 as well as resident T cells4. Here, a protocol for the preparation of human lung tumor slices, immunostaining of resident CD8 T and tumor cells, and tracking of CD8 T lymphocytes within the tumor microenvironment using confocal microscopy is described. This system is uniquely placed to screen for novel immunotherapy agents favoring T cell migration in tumors. CD8 T cells play a key role in the battle against cancer. However, many suppressive mechanisms prevent T lymphocytes from killing malignant cells. Over the last years, several promising strategies that release the brakes on T cells have been developed and used in the clinic5. The two approaches that retain considerable attention are immune checkpoint-targeting antibodies, such as anti-PD-1 and adoptive T cell therapies. Nevertheless, despite recent successes, only a subset of patients benefit from these therapies6. A major challenge is to identify mechanisms of resistance to cancer immunotherapy in order to develop more efficient treatments. Another challenge is to develop model systems in which novel therapies can be characterized and tested for their potency and safety. So far, most of these assays are based on in vitro cell culture systems that poorly mimic the complexity of the tumor tissue. Ex vivo tissue slices is a promising technique, as it preserves the original tissue microenvironment7. Over the years, we have set up this approach to track the dynamics of T lymphocytes in various tissues. 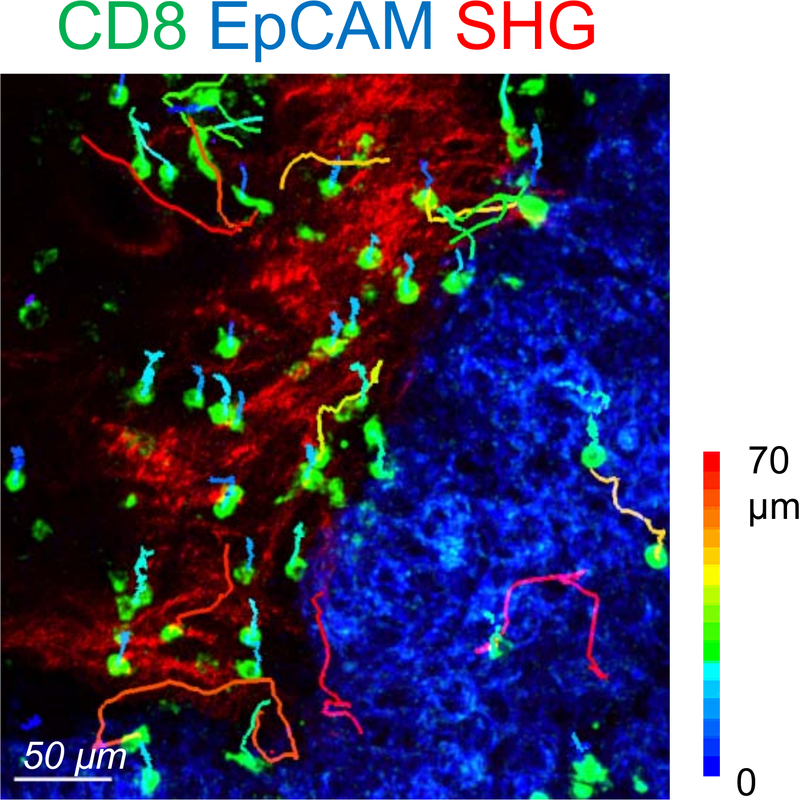 Our results indicate that fluorescently labeled T cells added atop murine lymph node slices migrate into the tissue and respond to their appropriate microenvironmental cues1,2. Similarly, T lymphocytes overlaid onto human lung tumor slices are rapidly recruited into the tumor stroma3. Using this technique, we have identified the extracellular matrix as an important element in controlling the distribution and migration of T cells within human tumors3,4. Because the behavior of ex vivo purified and plated T cells does not necessarily reflect the behavior of resident intratumoral T lymphocytes, we have recently refined this approach4. Here we describe a protocol to track resident T lymphocytes within slices made from fresh human lung tumors. 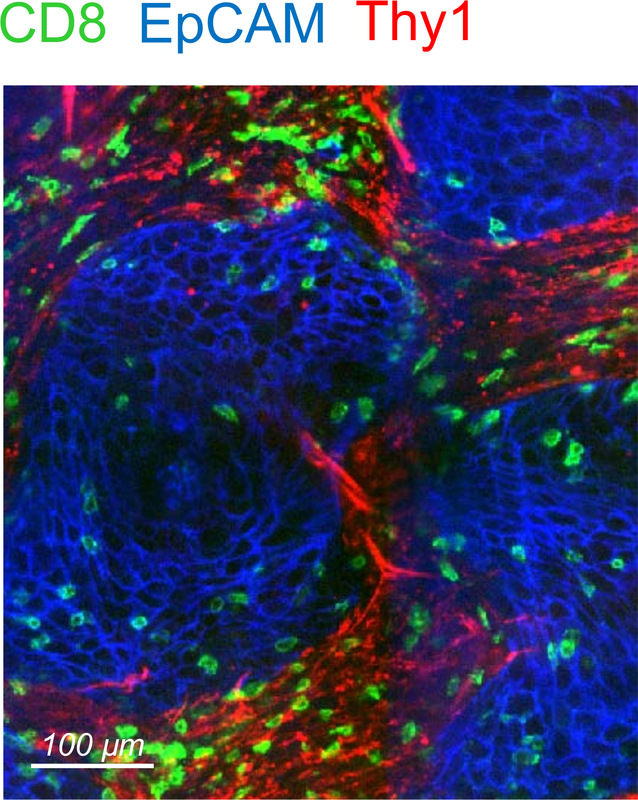 The different steps consist of the preparation of human lung tumor slices (including agarose embedding and vibratome sectioning of the embedded tissue), the staining of endogenous T cells with fluorescent antibodies in fresh tumor slices, and the monitoring of these cells with a confocal microscope. Human tumors were obtained with the agreement of the French ethical committee and by the Assistance Publique-Hôpitaux de Paris (AP-HP) in application with the article L.1121-1 of the French law. A written informed consent was obtained from the patients prior to inclusion in the study. Obtain fresh lung tumor samples from patients with stage I-III non-small cell lung cancer who underwent a complete surgical resection of their lung tumors4. Transport the non-fixed fresh tumor in 15 mL conical tube containing ice-cold Roswell Park Memorial Institute (RPMI 1640) medium. Set aside on ice for 30 min until step 2.7. NOTE: When tumors are received in the afternoon, place them at 4 °C overnight and process the following day. In this case, supplement the RPMI-1640 media with 5% fetal bovine serum (FBS). NOTE: Perform all steps until 2.10 under sterile conditions. Prepare 5% agarose solution for embedding by dissolving 1 g low-melting point agarose in 20 mL sterile of Phosphate-buffered saline (PBS) without calcium and magnesium. Microwave this solution until the agarose is completely dissolved. Allow the agarose to cool at 37 °C by placing the solution in an incubator at 37 °C for 5 min. In a tissue culture hood, prepare complete RPMI-1640 medium (without phenol red) containing 10% fetal bovine serum (FBS), 4 mM L glutamine and 1x penicillin and streptomycin. Add 1.1 mL complete RPMI-1640 medium per well to a 6-well cell culture plate and place a 30 mm cell culture insert in each well. Set the plate aside in an incubator at 37 °C for 30 min until step 2.12. Place sterilized stainless steel flat washers (inner diameter of 5 mm, outside diameter of 10 mm and thickness of 1 mm) in a 35-mm plastic dish filled with RPMI complete medium. Washers will be further used to concentrate the antibodies on the vibratome-cut slice. Place the tumor biopsy in a 10-cm plastic dish and cut the tumor with a sharp blade into small cube shape fragments of approximately 5x5 mm length. Take out the agarose from the incubator and pour the solution into a 35-mm plastic dish. Use a pair of forceps to carefully transfer the tumor fragments to a tissue wipe to remove the excess of medium. Insert the fragments into the agarose and position them at the bottom of the plastic dish. Leave the agarose gel on ice for 5 min to solidify. Once the agarose solidifies, invert the plastic dish and use a spatula to release the entire gel. Use a sharp blade to trim the excess agarose surrounding the tumor fragment, leaving 3-5 mm of gel around the tissue. Mount each agarose block on the specimen disk of the vibratome with a drop of non-toxic butyl cyanoacrylate tissue glue. Fill the vibratome buffer tray with sterile ice-cold PBS and Install the specimen disk in the tray. Cut the agarose embedded tissue into 350 µm thick slices. Adjust the vibratome settings at a slow range speed (0.2-0.3 mm/s) and the vibration frequency at a medium range (1.5 mm). Using fine forceps, carefully collect the tumors slices as they are being cut and place them flat onto the cell culture inserts of a 6-well plate (step 2.3). Transfer 1 slice on each insert. Use great care when handling slices as they can be easily damaged. Use fine forceps to place stainless steel washers on each individual slice. Make sure washers are well positioned on the agarose surrounding the tumor tissue. Maintain the culture plate at 37 °C in a 5% CO2 humidified incubator for 10 min. Proceed to immunostaining. Dilute the antibodies (final concentration 10 µg/mL) and the nuclear dye (final concentration 1 µg/mL) in RPMI-1640 media without phenol red. NOTE: Use fluorescently-coupled anti-CD8 (murine IgG, clone SK1) and anti-EpCAM (epithelial cell adhesion molecule) (murine IgG HEA-125) antibodies to label CD8 T lymphocytes and tumor epithelial cells, respectively. Use fluorescently-coupled anti-CD90/Thy1 (murine IgG, clone 5E10) antibody to label fibroblasts and activated endothelial cells. Use 4',6-diamidino-2-phenylindole (DAPI) to label the nucleus of cells with a compromised plasma membrane in order to assess tissue viability. Remove the culture plates from the incubator and use a pipette to aspirate any liquid inside the stainless steel washers. Do not remove the 1.1 mL RPMI-1640 media placed under the cell culture inserts (step 2.3). Without touching the slice and using a pipette tip, add 40 µL of the solution containing the antibodies onto each tumor slice. Incubate the plate at 37 °C for 15 min to allow antibody staining. With fine forceps, remove the washers, take out the slices, and dip them 10 s in RPMI-1640 media without phenol red. Place back the slices onto the cell culture inserts and add a drop of phenol red-free RPMI-1640 medium on each individual slice. Maintain the plate at 37 °C for 10 min. Proceed to imaging. NOTE: The confocal microscope used in this protocol is an upright spinning disk equipped with a 25x water immersion objective (25x/0.95 N.A.). Set the temperature of the microscope heat-chamber at 37 °C a few hours before starting the imaging session. Set up a system to constantly perfuse tumor slices with oxygenated (5% CO2, 95% O2) phenol red-free RPMI medium (Figure 1). 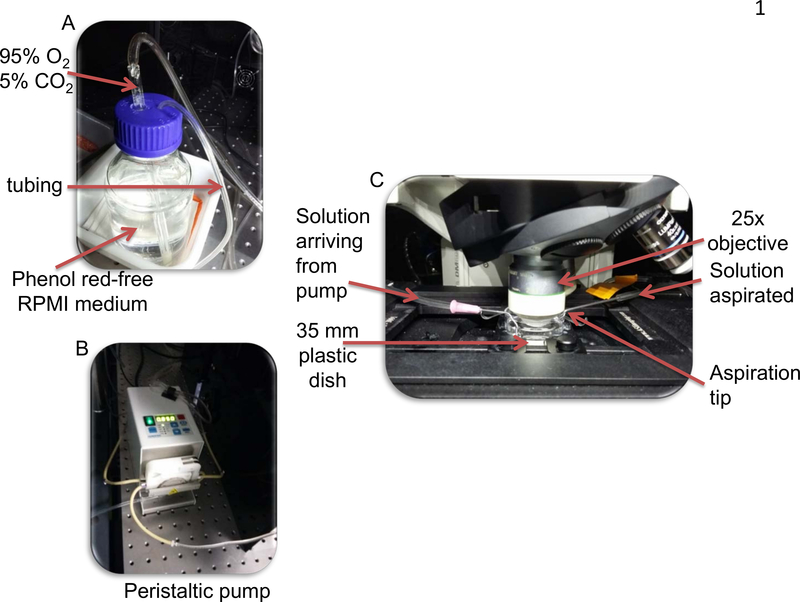 Use a peristaltic pump to flow the perfusion media into the imaging chamber and to aspirate the solution to a waste collection flask. Run the peristaltic pump to allow the oxygenated solution to go through the perfusion tubes. With fine forceps, take out the slice from the 6-well plate and transfer it to the 35-mm plastic dish filled with phenol red-free RPMI medium. Immobilize the slice with a 19.7 mm diameter slice anchor with 2 mm spaced-threads. Place the Petri dish on the imaging stage of the microscope. Connect the inlet and outlet tips of the perfusion system. Turn on the perfusion system and set the media flow rate to 0.8 mL/min. Lower the water-immersion objective to the slice. Focus on the top of the slice with bright field light. Using appropriate fluorescent light, select a region of interest that contains CD8 T cells, tumor islets (positive for EpCAM) and a stroma area (positive for CD90). Check the viability of cells within the slice by assessing DAPI staining at the cut surface and deeper into the tissue. NOTE: A healthy slice contains only a minority of DAPI positive cells at several microns from the cut surface. Set an imaging session with the following actions. Depending on the intensity of the fluorescent signal of the 3 fluorophores, set the exposure time between 50 to 800 ms and the laser intensity between 20 to 40%. Select the z stack thickness to image within the tumor slice. NOTE: Here, 10-12 optical planes spanning a total depth of 60-70 µm in the z dimension were captured. Select the start position at approximately 10 µm below the first labeled CD8 T cells. Define the time interval between each z-stack image between 10 to 30 s and the total recording time between 10 to 30 min. Analyze resident CD8 T cell migration as described in reference4. After importing the data to a tracking software, create spots for each CD8 T cell in the field. Adjust the diameter of the cells and the threshold of detection according on the imaged fluorescent cells. Inspect the tracks and remove any irrelevant track by deleting them. Correct tracks by connecting and disconnecting different tracks and different time points of the same tracks. Export the data (track speed, track displacement length) to a spreadsheet software. Human lung tumors are usually highly infiltrated in CD8 T cells that are preferentially found in the stroma3,4. By following this protocol one should expect to visualize a large number of immunostained CD8 T in human lung tumor slices. A co-labeling with anti-EpCAM and anti-CD90 antibodies should permit to delineate tumor islets and stromal areas. Fibrillar collagen, abundant in the tumor stroma, can be visualized without exogenous staining by using second harmonic generation on a two-photon microscope3,4. Note that some human lung tumors present no clear distinction between tumor islets and stroma. Such tumors should be discarded as well as specimen presenting large areas of cell necrosis identified by non-specific binding of antibodies and DAPI staining. Consistent with published results obtained in human lung and ovarian carcinomas, resident CD8 T cells are more concentrated in the stroma compared to tumor islets4. A representative example of CD8 T cell distribution in relation to tumor cells and CD90 is shown in Figure 2. The slice assay allows for the analysis of resident T cell motility in different tumor regions. Useful criteria for comparing CD8 T cell motility in different regions include the average velocity (path length divided by the time duration sampled) and the displacement length (the vector between the beginning and end of a track). Although scarce in tumor islets, CD8 T cells migrate more actively in this compartment compared to the stroma (Figure 3). On average, the mean velocity of individual CD8 T cells should be close to 4 µm/min in the tumor stroma with high intra and inter-tumor variabilities4. In the tumor stroma, the motility of resident T cells is strongly influenced by the density and orientation of extracellular matrix fibers3,4. A successful experiment will result in less T cells present in dense matrix areas compared to loose matrix regions, consistent with published results3,4. Note that some human lung tumors exhibit a very high level of autofluorescence precluding imaging of resident T cells. Such feature is rapidly observed at the beginning of the imaging session. Autofluorescent tumors should be discarded. A representative example of resident CD8 T cells in an autofluorescent tumor is shown in Figure 4. Figure 1: Photographs of the perfusion system. A) The phenol red-free RPMI solution is enriched in 5% C02, 95% O2. B) The solution is then perfused by a peristaltic pump. C) The RPMI solution enters the culture dish via the inlet. At the outlet, the solution is aspirated by the pump from the chamber into a waste container. Note that the aspiration tip is set at a level to determine solution height. Please click here to view a larger version of this figure. Figure 2: Distribution of resident CD8 T cells in a human lung tumor. Representative image of a human lung tumor slice stained for CD8 (green), EpCAM (blue) and CD90 (red). Please click here to view a larger version of this figure. Figure 3: Motility of resident CD8 T cells in a human lung tumor. Trajectories of individual resident CD8 T cells in the stromal (red) and tumor cell (blue) regions of a human lung carcinoma slice. The slice was stained with the indicated antibodies and imaged for 20 min with a confocal microscope. The fibrillary collagen was detected at the end by using second harmonic generation (SHG) on a two-photon microscope. Tracks are color-coded according to CD8 T cell displacement length. This image has been modified from 4. Please click here to view a larger version of this figure. Figure 4: Representative image of an autofluorescent human lung tumor. The tumor slice was stained for CD8 (green) and EpCAM (blue). The SHG signal is in red. Please click here to view a larger version of this figure. A straightforward, quick, and robust technique for generating human lung tumor slices and assessment of the dynamic behavior of resident CD8 T cells in a preserved tumor environment using a confocal microscope is described. This protocol is a refinement of a previous JoVE article that describes the monitoring of plated T cells onto murine lymph node slices2. Bleaching of fluorescent dyes must be considered especially with first generation dyes like fluorescein isothiocyanate and phycoerythrin. We found that a pronounced photobleaching of directly-coupled antibodies occurred with a two-photon microscope. Conversely, minimal photobleaching was noticed with confocal microscopes, especially using bright fluorescent dyes developed recently. Antibodies are relatively big molecules and therefore their penetration into the tissue can be difficult. This step can be improved by increasing the incubation time. In addition, the use a smaller staining reagents such as directly-coupled Fab fragments of antibodies represents a good alternative. All antibodies described in this protocol have been previously validated and known to produce bright staining4. Therefore, isotype controls are not required. However, if modifications to this method using other antibodies are desired, then the use of isotype control antibodies is highly recommended. This experimental system presents some limitations. The cutting procedure will damage the tissue, which may affect the behavior of CD8 T cells, especially near the cut surface. In addition, a number of soluble factors (e.g. chemokines) instrumental in controlling the migration of T cells can be lost. One way to bypass these problems is by monitoring T cells located at several tens of microns from the surface in presumably healthier regions of the tissue. Published experiments reveal that T cells localized deep within the tissue migrate more actively than T cells localized near the cut surface4. We have used confocal microscopes for our studies but it is likely that two-photon microscopes will increase the spatial resolution in depth. This approach relies on the use of fluorescently-coupled antibodies that are not neutral molecules. Full-sized antibodies are susceptible to affect the normal functioning of T cells in different ways. First, anti-CD8 antibodies can alter T cell migration by triggering an intracellular signaling cascade capable of affecting the cytoskeleton of the lymphocyte. Second, anti-CD8 antibodies can modulate the interaction between CD8 and MHC class I molecules, an important step in the antigen recognition process. Third, intact antibodies can bind to Fc receptors expressed by many myeloid cells distributed in the tumor and therefore susceptible to increase the non-specific signal. We have no indication that such a problem affected our data, probably because Fc receptors of resident myeloid cells are, unlike cells in culture, saturated with immunoglobulins present within the tumor milieu. Indeed, the addition of serum during the labeling procedure, a process known to block free Fc receptors, did not change the immuno-staining. Nonetheless, Fab fragments of antibodies, devoid of Fc region, as well as antibodies mutated in their Fc region and camelid-derived antibody fragments8 represent other alternative strategies to track resident cells with fluorescent tracers. Over the last decades, several model systems have been developed and used for the real-time imaging of T lymphocytes. These include in vitro preparations of T cells previously purified and cultured with antigen-presenting cells. Such preparations have allowed remarkable progress in defining the mechanisms of antigen recognition and responsiveness. However, they lack the complexity of the tissue environment. Other preparations have been established that more closely mimic the structure of a native tissue. For examples, three-dimensional collagen gel matrices in which purified T cells have been embedded, as well as culture of reaggregated tissue fragments have been used to monitor the dynamic behavior of T lymphocytes with fluorescent imaging technologies9. These systems present the advantage of an architecture close to the native tissue, but they lack other important cellular and soluble factors. In mouse, two-photon intravital microscopy has been employed to track T cells in the truly physiological environment of an intact organ10. However, such approach is technically difficult to set up. In addition, mouse models show notable differences with the human physiology. The technique described in this protocol represents a complex multi-cellular tumor environment that is uniquely positioned to act as an important link between co-culture studies and animal models. The protocol described herein can also be used for tracking the motility of other cells than CD8 T lymphocytes for which antibodies have been generated. Furthermore, the technique can be adapted to other human and murine tumors and tissues. For instance, we have been able to image in real time the dynamics of B cells labeled with an anti-CD19 antibody in fresh human tonsils. The technique described in this protocol allows to screen for therapeutic molecules controlling T cell motility in tissues. The accessibility of the culture system permits to apply some pharmacological reagents and test their consequences on T cell migration. It is now accepted that in growing tumors, CD8 T cells exhibit a low migration and reduced contacts with tumor cells11. Importantly, the scarce presence of T cells in tumor cell regions is associated with a bad outcome and is considered to be one of the resistance mechanisms to T cell-based cancer immunotherapy. Multiple obstacles limiting T cells from migrating in tumors have been identified including a dense extracellular matrix. In this respect, the identification of molecules able to restore T cell motility and interaction with malignant cells represents an important step in cancer immunotherapy. In a previous study, we found that a partial degradation of collagen with collagenase, acutely applied to human lung slices, improves the contact of T cells with tumor cells. Finally, the possibility to keep human tumor slices in culture for up to several days7,12,13 offers a number of promising applications in term of T cells and immunotherapy. However, the stability of the model system during long term culture is an important parameter that needs to be thoroughly assessed. Obtaining fresh and healthy tissue is a critical factor to produce quality slices with good immunostaining of CD8 cells, tumor cells, and stromal elements. Keeping the tumor biopsy at 4 °C before processing is crucial. The handling of slices with fine forceps represents another critical step within this protocol. This should be performed with great care as the agarose can be easily damaged. A cut in the agarose will compromise the seal made by the stainless steel washer resulting in a leakage of the antibody containing solutions. We wish to thank Pierre Bourdoncle and Thomas Guilbert of the Cochin Imaging Facility (Institut Cochin, Paris) for advice and assistance with microscopes. This work was supported in part by grants from the French Ligue Nationale contre le Cancer, by the CARPEM (Cancer Research for Personalized Medicine), by the Fondation de France and by the European Union's Horizon 2020 research and innovation programme under grant agreement No 667980 (CARAT). Asperti-Boursin, F., Real, E., Bismuth, G., Trautmann, A., Donnadieu, E. CCR7 ligands control basal T cell motility within lymph node slices in a phosphoinositide 3-kinase- independent manner. J Exp Med. 204, (5), 1167-1179 (2007). Salmon, H., et al. Ex vivo imaging of T cells in murine lymph node slices with widefield and confocal microscopes. J Vis Exp. (53), e3054 (2011). Salmon, H., et al. Matrix architecture defines the preferential localization and migration of T cells into the stroma of human lung tumors. J Clin Invest. 122, (3), 899-910 (2012). Bougherara, H., et al. Real-Time Imaging of Resident T Cells in Human Lung and Ovarian Carcinomas Reveals How Different Tumor Microenvironments Control T Lymphocyte Migration. Front Immunol. 6, 500 (2015). Mandal, R., Chan, T. A. Personalized Oncology Meets Immunology: The Path toward Precision Immunotherapy. Cancer Discov. 6, (7), 703-713 (2016). Wolchok, J. D., et al. Nivolumab plus ipilimumab in advanced melanoma. N Engl J Med. 369, (2), 122-133 (2013). Vaira, V., et al. Preclinical model of organotypic culture for pharmacodynamic profiling of human tumors. Proc Natl Acad Sci U S A. 107, (18), 8352-8356 (2010). Rashidian, M., et al. Noninvasive imaging of immune responses. Proc Natl Acad Sci U S A. 112, (19), 6146-6151 (2015). Wolf, K., et al. Collagen-based cell migration models in vitro and in vivo. Semin Cell Dev Biol. 20, (8), 931-941 (2009). Joyce, J. A., Fearon, D. T. T cell exclusion, immune privilege, and the tumor microenvironment. Science. 348, (6230), 74-80 (2015). Gerlach, M. M., et al. Slice cultures from head and neck squamous cell carcinoma: a novel test system for drug susceptibility and mechanisms of resistance. Br J Cancer. 110, (2), 479-488 (2014). Holliday, D. L., et al. The practicalities of using tissue slices as preclinical organotypic breast cancer models. J Clin Pathol. 66, (3), 253-255 (2013).